Congressman Michael Capuano is one of the lawmakers headed to the border to see what he describes as an embarrassment for the country. As disturbing sights and sounds from separated families continue to capture the nation’s attention, medical experts are starting to voice their concerns about long-term health repercussions that can result from this kind of childhood trauma, and more lawmakers are heading to the border to see all of this first hand. Congresswoman Katherine Clark is one of the lawmakers headed south. She says she wants to hear stories from incarcerated parents and detained children and to ask questions of officials. “When it’s an immoral order, they have an obligation, as far as I’m concerned, either to disobey it or to resign,” Capuano said. Meanwhile, Senator Ed Markey was at the East Boston Neighborhood Health Center where he responded to President Trump’s executive order. 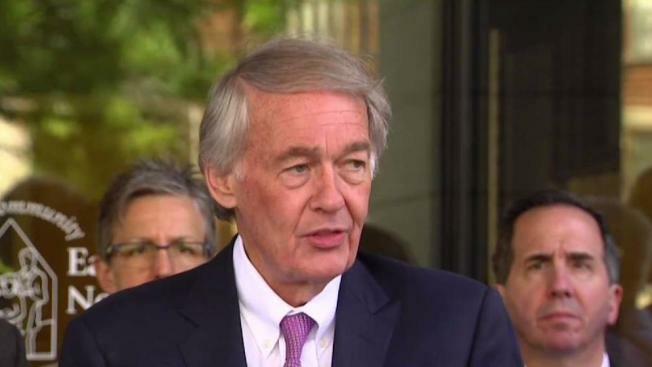 “Donald Trump has simply traded the cage he is putting the children into,” said Sen. Markey, who also called on medical experts. One such expert is Boston Medical Center Child Psychiatrist Lisa Fortuna, who says the road to recovery could be a treacherous one. "Traumatic experiences like this, especially in childhood, can result in irreparable or very difficult-to-heal damage to the brain structures,” Fortuna said. Medical experts say job one is to reunite parents and children as quickly as possible since they say every minute of separation contributes to the potential long-term harm.